Now geeky pet owners can make their dogs carry their own treats and poop bags in style! 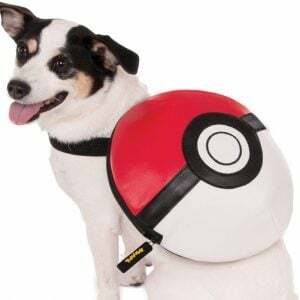 Catering to dogs of all breeds and sizes, this Pokeball backpack is the ideal every day costume for your pet on walks to the beach or park. Kuriboh may have low stats that prevent him from being able to hold his own, but outside battle, this little hairball makes an excellent cuddle buddy! The fun-loving plush has a soft round belly and measures six inches from head to toe.